I am, however, a brunch person. Brunch happens early in the day, when I am sharp, quick of wit and caffeinated, and there’s seldom more than a handful of good friends or family members in attendance. People leave at a reasonable hour, typically before they do a header into the hot crab dip and somebody calls them a cab. That’s my kind of gathering. Brunch menus are easy to design. 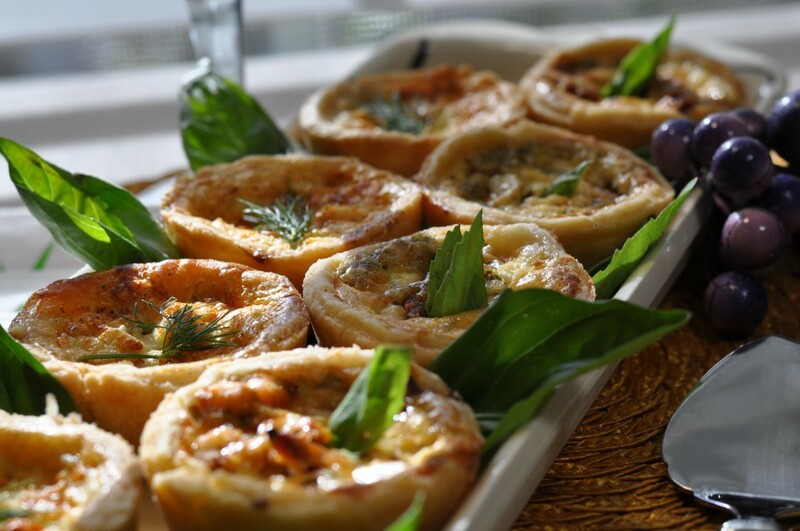 Some fresh fruit…scones or a coffeecake you bake in advance…juice…coffee…and, of course, something delicious baked in a pastry like these mini quiche. They’ll do nicely for your obligatory egg dish, without which no brunch is complete. I give you two of my favorite variations here – crab or sun dried tomato and Feta – but as you can imagine there’s almost no limit to the variations you can spin. Sauteed mushrooms and Brie? Crumbled bacon and blue cheese? Broccoli and Cheddar? I think you get the idea. Once again, we call on our reliable GOOD BASIC PIE DOUGH to line our pan of choice, a standard 12-cup muffin pan, preferably nonstick. There are a couple of ways you can do this. 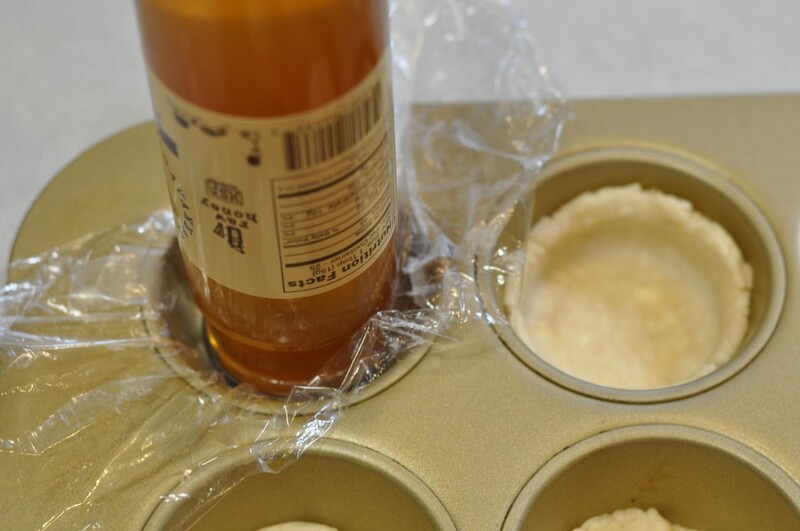 In the first, you can divide the dough into 12 equal-size pieces as soon as you take it out of the food processor…then simply press it into the individual cups. This method is ideal for the rolling averse, but takes a little patience to make the bottom and sides evenly thick and somewhat straight across the top edge. I’ve written about this previously, but if you put narrow strips of wax paper in the cups before adding the pastry (last row on right, below) it makes it simple to lift the baked quiche right out of the pan when they’re done – an especially good idea if you’re not using a nonstick pan. 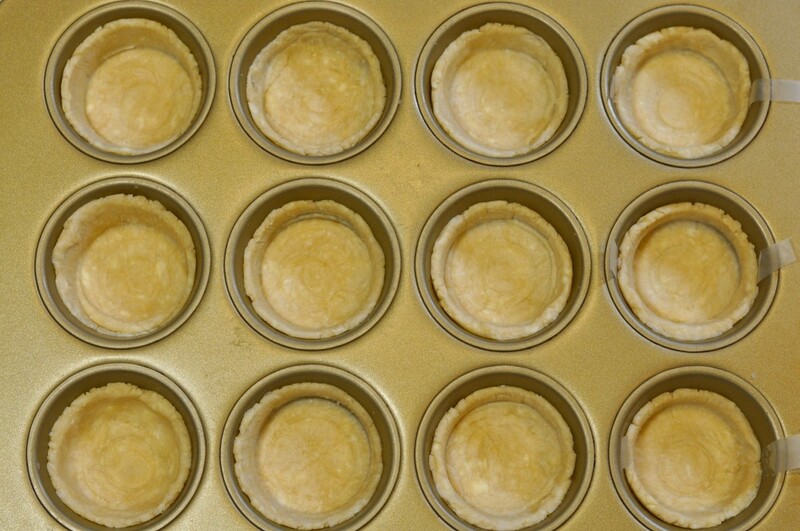 Incidentally, the photo below shows the pastry cups before I used my fingers to press the dough further against the sides of the cups, making the dough thinner and taller in the cups. You want the dough to be on the thin side because these cook quicker than your average pie and you don’t want the pastry to be under-baked. The alternate method is to roll out your chilled dough (a little thinner than usual) – about a third at a time – and cut it into circles with a 3 3/4″ to 4″ cutter. The circles are then pressed evenly into the cups. The advantage of this method is that you’re starting with a nice, even-thickness dough. Once the pastry cups are formed, the dough chills in the pan for about 30 minutes. While that happens, get out your filling ingredients and prepare your custard mixture. By volume, your filling solids will take up about half of each cup and the custard will take up the rest of the space and fill in around your other ingredients. 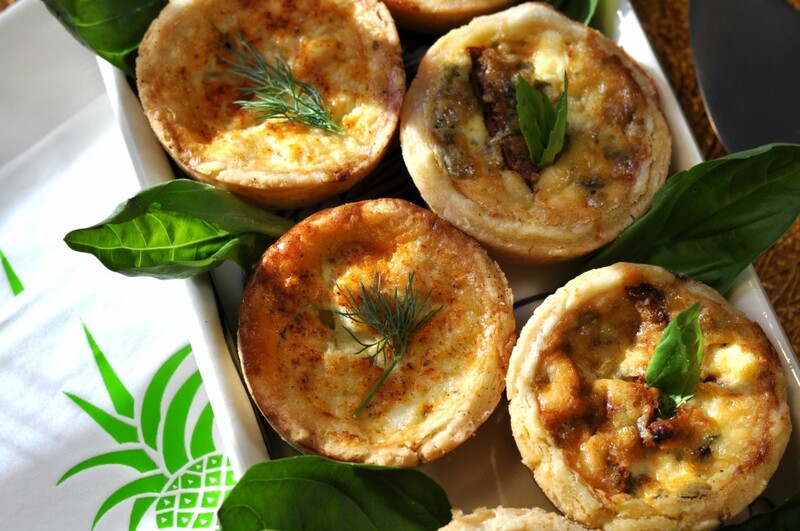 Your mini quiche will need to bake for 25 to 30 minutes. I often start them out on a low oven rack, to help “set” the crust, then switch them to a rack in the center of the oven to finish them off. This seems to work well. Bake them just long enough that the tops start to brown lightly, which gives them an appetizing color. Don’t be surprised if they dome up in the center as they bake. They will. Then they’ll settle as they cool. Cool them in the pan for about 10 minutes, on a rack, then loosen with a knife and transfer to a rack and continue to cool. They’re best served warm, and they can easily be made a day ahead, refrigerated, and then rewarmed on a baking sheet in a 325° oven for 10 to 12 minutes just before serving. 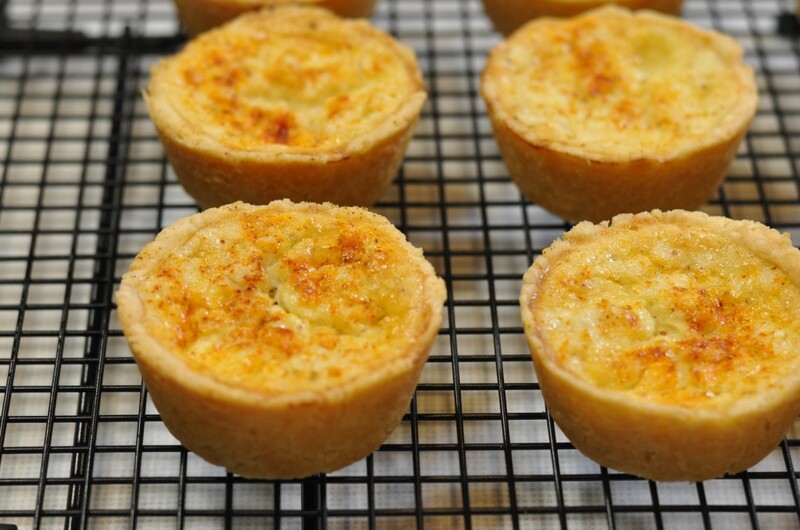 Anyway, that’s it for our mini quiche. They’re a sub-category of something I’m going to be covering extensively in 2013 at The Pie Academy – small pies, mini pies and individual pies. You may have noticed that it’s a hot topic these days, and it shows no sign of abating. So stayed tuned here for lots more on mini pies. And just as a little tease, let me show you a mini apple pie I made alongside the savory ones pictured above. 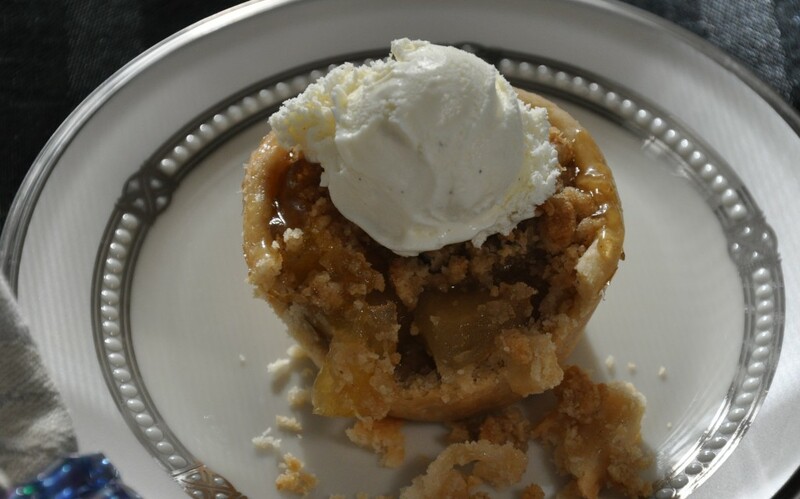 All I did was press the dough a little thinner all around, to the top of the cup…filled the shell with precooked apple filling…then topped with a favorite brown sugar crumb topping. Like I say, much more about this topic in coming months. Meanwhile, I hope you finish out the year in style…and, as always, let me know how you’re doing, pie-wise, and send me your ideas for the New Year. PASTRY NOTE: Use any pastry you like here, but my first choice is the GOOD BASIC PIE DOUGH. Using floured fingers, press the dough into the bottoms and about two-thirds up the sides of the cups, keeping it as uniform as possible. Refrigerate the pan for 30 minutes. Alternately, prepare and chill the dough as usual. Cut into thirds (so you're not working all the dough at once) and roll - a little thinner than usual - on a floured surface. Using a 3 3/4" to 4" cutter, cut into rounds and tuck them evenly into the shells. Gather scraps and re-roll, if necessary, to make additional shells. Refrigerate the pan for 30 minutes. Preheat the oven to 350° after 20 minutes. PREPARE THE FILLING: For EITHER version, whisk together the cream, ranch dressing, mustard, salt and pepper. Whisk in the milk and eggs, until evenly combined. For the CRAB version, whisk in the Old Bay at this point. For the FETA version, whisk in the basil at this point. For the CRAB version, divide the crab meat and cheese evenly between the chilled cups. Using a small ladle or measuring cup, divide the custard mixture evenly between the cups. Dust with paprika or seafood seasoning. For the FETA version, divide the Feta, sun-dried tomatoes and olives evenly between the cups. Using a small ladle or measuring cup, divide the custard mixture evenly between the cups. Bake the quiche on a lower oven rack for 10 minutes. Move the pan to the middle rack and bake an additional 15 to 20 minutes, until the quiche are "set" and lightly browned. Transfer the pan to a rack and cool for 10 to 15 minutes. Loosen the quiche with a knife, transfer to a rack, and continue to cool. Serve warm, reheating if necessary. Makes 12 mini quiche.